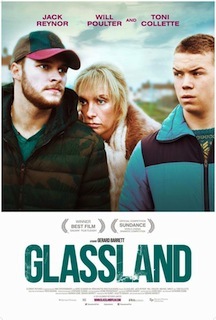 Movie Review: Simultaneously plaintive and modest, “Glassland” is an Irish independent drama written, directed, and co-produced by Gerard Barrett, and starring Jack Reynor, Toni Collette, and Will Poulter. The story is set in a cheerless little Irish town where John (Reynor), a good-hearted taxi driver spends most of his time running after his desolated alcoholic mother, Jean (Collette), whose life is in danger due to serious liver damages. In the first scene, John arrives at home after work just to find Jean in her bed, vomited and in an alcoholic coma. He was able to save her at the last minute, a story that repeats itself for a long time. Extremely tired of the situation, John almost doesn’t believe in a different scenario anymore. Mother and son behave furiously by turns - at first it was Jean who loses control when she doesn’t find booze at home after returning from the hospital; and then was John who gets pissed off when Jean misses work and vanishes one more time, what means another long sleepless night looking for her. Next day he shouts angrily: ‘my mother smiles and loves. This is not my mother. This is an animal, and you’re breaking my heart every single day!’ John still finds the strength to visit his 18-year-old brother who was born with Dawn syndrome and was early abandoned by Jean in a care facility, right after her companion has turned his back on her when he found out about the child’s condition. In one of the saddest scenes of the film, the powerless John joins his mother in a drink at home, and the little party ends up in an extended, dispirited monologue, in which Jane clarifies some aspects of her life. A gleam of hope still burns in their hearts, but the financial means to maintain Jean under treatment is another issue that pushes John into obscure solutions. In parallel, we vaguely follow the path of John’s unmotivated best friend, Shane (Poulter), who gets more than happy to leave the lugubrious town. A few scenes are emotionally strong, but Mr. Barrett, more lucidly than boldly, arranged everything too easily in one direction (Jean’s recovery) and too vague in the other (the obscure side of John’s life). Accordingly, I got slightly disappointed when the final credits rolled, meaning that I expected something deeper from the ending and something that was less basic as the whole picture.